• PLOT SUMMARY: Limited 70th Frame Variant by BRANDON PETERSON. A DARK REIGN TIE-IN - Written by GREG PAK. Art by ALLAN JEFFERSON and NELSON PEREIRA.. Patriot or Traitor? Hero or killer? Man or machine? James Rhodes fights for his very soul as he takes on the most deadly incarnation of his greatest enemy. 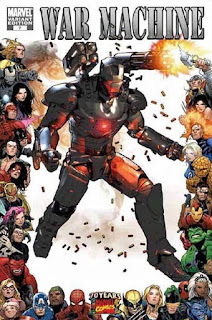 Get ready for the new Ultimo and the last temptation of War Machine in the book that has Wizard raving 'My favorite new ongoing Marvel series continues to impress...Greg Pak's tech-heavy thriller keeps the action pumping faster and more furious than rounds from a .50 caliber Gatling gun.